From the director of Together comes this somewhat coming-of-age tale set in the world of punk rock in 1980’s Stockholm. Klara and Bobo are two 13-year old best friends who thrive on the world of punk rock music, despite everyone around them saying punk rock is dead. When the girls get annoyed by the hard rock sound of teenage rock band Iron Fist at the local community center, the two girls realize they have found a cause. They decide to form their own band with one little problem. They don’t know how to play music. At the local fall festival, Klara and Bobo find their saving grace in Hedvig, a young Christian teen who has a knack for music. The trio soon become friends with Hedvig teaching the other two how to play while the punk duo teach their new friend a thing or two about punk rock and how it works. As the trio learn how to play and prepare for an upcoming show, this trio of girls learn a thing or two about life in the process, even when it means staying true to who they are. 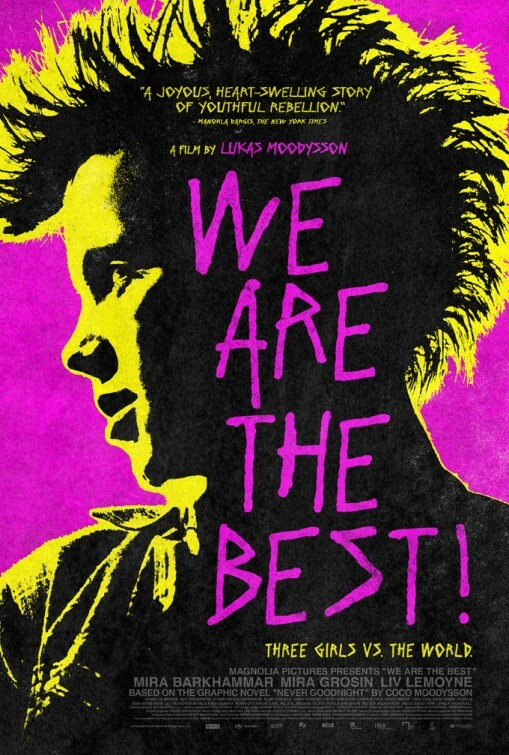 Swedish filmmaker Lukas Moodysson is quite an interesting talent behind the cameras. He tends to make films that depict structured situations that channel real-life and the effect life has on its characters. For this film, which compared to his other films is perhaps his tamest film in his filmography, centers on the world of punk rock in the early 1980’s. While it is set at a time where in fact punk rock had lost popularity to the era of New Wave music, there were still some loyal followers of the genre, including our three protagonists. Teen actors Mira Barkhammar and Mira Grosin show great chemistry as best friends Bobo and Klara. They see punk rock clearly as a way to break away from their somewhat interesting family lives. Bobo deals with a philandering mother yet her father comes to see her from time to time. As for Klara, her parents are clearly a little too “free-spirited” if that makes sense. It is clear that Klara is the more strong-minded of the two perhaps due to her having to have some sort of strength due to her parents’ free-spirited minds. However, it is clear that some of Klara’s decisions tend to be more of a hindrance than a good idea. While this can be said to be a coming-of-age tale, the one who really changes is their new friend Hedvig, played by Liv LeMoyne. She clearly transitions from shy, Christian, folk singer/guitarist to the backbone, mentor, and eventual peacekeeper of the punk rock trio. When she naturally comes to join them, her chemistry with the duo seems uneasy at first but grows in a positive way. Eventually, she takes charge when an incident threatens the friendship between Bobo and Klara. The music helps drive the film as well. While personally, the punk rock I’m used to include bands like The Clash, Rancid, and Green Day, this was an introduction to Swedish punk rock and it’s actually pretty cool. However, there are some new wave tracks to endure including the Human League’s most popular song, “Don’t You Want Me” and some Joy Division perhaps. However, the point is clear that punk rock never really and most likely, never will die, and that’s not a bad thing at all. We Are the Best is a pretty good coming of age tale with three very good young talents in the roles of teens who thrive on punk rock and show the haters that punk rock will never die, even as they learn a little about life in the process. Definitely a great Moodysson film. A Memfis Film AB production. Director: Lukas Moodysson. Producer: Lars Jönsson. Writer: Lukas Moodysson; based on the graphic novel “Never Goodnight” by Coco Moodysson. Cinematography: Ulf Brantås. Editing: Michael Leszczylowski. Cast: Mira Barkhammar, Mira Grosin, Liv LeMoyne, Johan Liljemark, Mattias Wiberg, Jonathan Salomonsson, Alvin Strollo, Anna Rydgren, Peter Eriksson, Charlie Falk, Lena Carlsson, David Dencik, Ann Sofie-Rase. coming of ageLiv LeMoyneLukas MoodyssonMira BarkhammarMira Grosinpunk rockteenagersWe Are the Best!